Wow, what a glorious day it was today. The sun was shining and no threatening clouds anywhere. 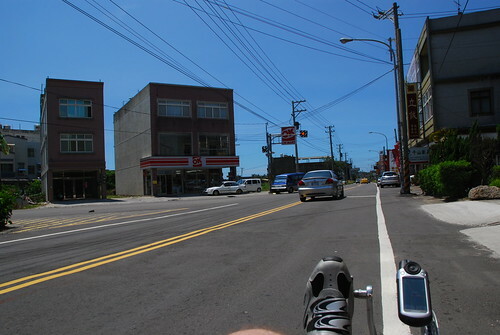 I put on my sunblock, strapped on my helmet and gloves and went for a nice ride on the trike. Today I decided that I would take my D80 and shoot more photos than I normally do. 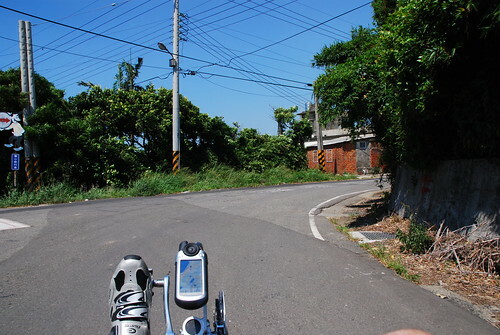 I found that I don’t mind riding with the camera around my neck. 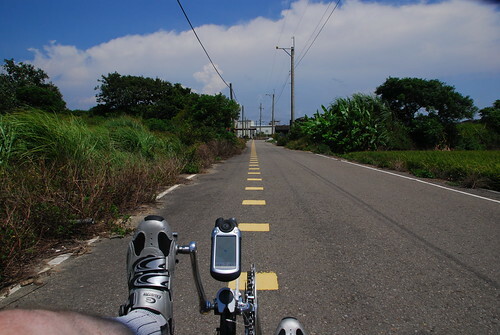 For those of you who are visiting from other countries, you’re going to get a nice view of what it’s like to ride in Taiwan. But that’s not all. 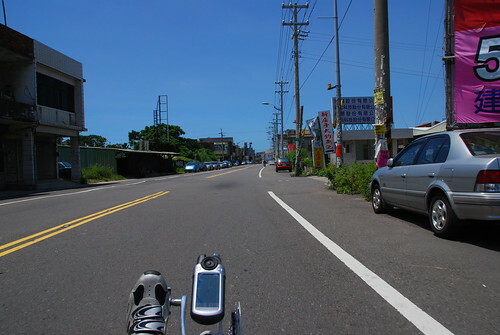 Since I had the GPS running, and the GPS was also recording a track log, I used GpicSync to geotag all the photos from my ride, so they work with geotag-aware sites such as Flickr. So, clicking on any photo will take you to the photo’s page on Flickr, where you can then view it’s position on the map. UPDATE: For some unknown reason, some of the photos in the blog did not link to their Flickr photo page. I’ll try to correct this but I cannot find the reason for it. The same exact procedure was used to post every photo but a group of them in the center of the article did not link. Weird. I broke the Nikon out around 30 minutes after I took off on my ride. 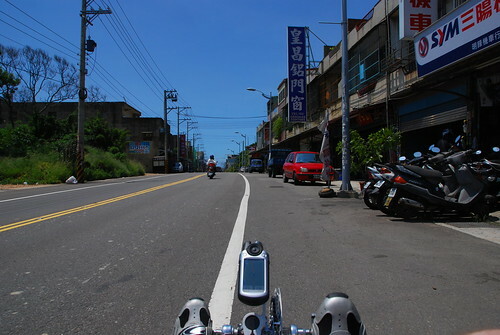 This is one of the roads that I ride on in the Sinfong area on my way to the coast. 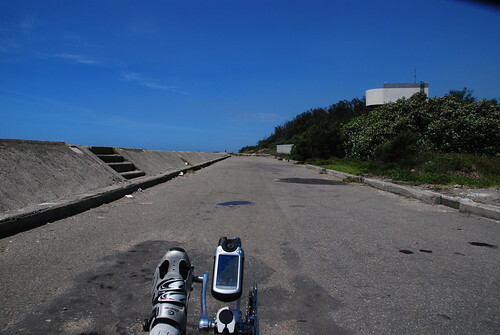 I was heading in the same general area as I had done in a previous ride, but I took a different route on the way back. These street shots are nothing special, but I’m familiar with them and some of these places represent personal milestones along the way. This is one of the intersections where you can take either the left fork, or the right fork. I took the right and kept going straight. I had to stop because this car was backing out of the garage shown to the right. 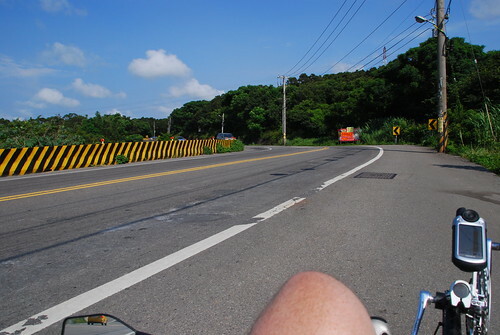 An elderly gentleman was waving the car on and out into the roadway, acting like a traffic cop. 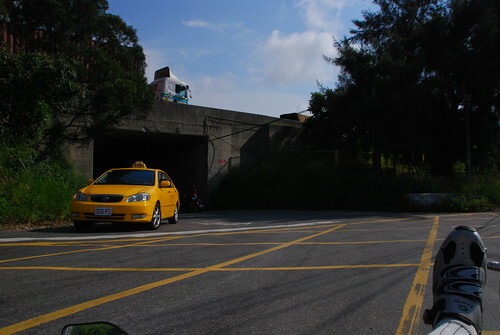 When the car was out in the middle of the road, he stopped is waving and went around to the front of the car. The driver didn’t stop though, and backed into a truck that was parked on the roadside. That dimple in the bumper is the result. I’m approaching an intersection that I’m always cautious of. 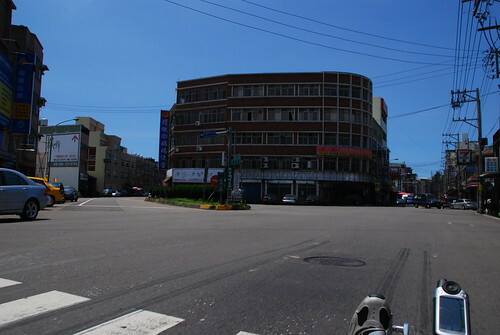 That is the “Chen Shan” woodworking store on the right. I like the store, but seeing it reminds me to be aware. 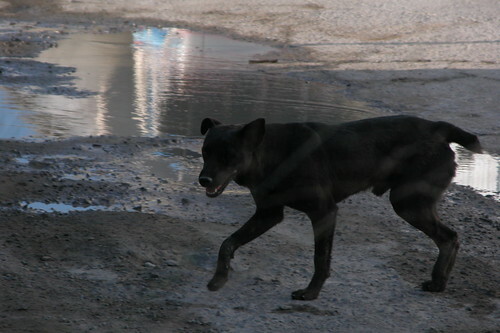 There is a group of stray dogs that live at the OK store. Whenever they see me, they run after me, barking. Some of them seem very aggressive and I’m always prepared to strike back at them. Today there was only one dog and he was asleep. Fortunately the trike is nearly silent and he didn’t wake up. About 2 KM back I was chased by one dog already. I gave him a good solid blast on the air horn and he went running for cover. 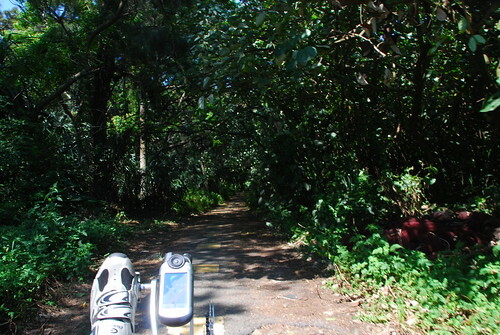 Like my previous ride, I took a left and went to the mangrove park area. 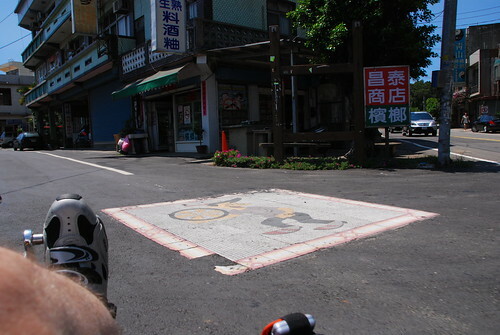 One of our famous bike path signs embedded in the road. This is the “red tree” area that we’ve blogged about before. Passing under the new route 61. 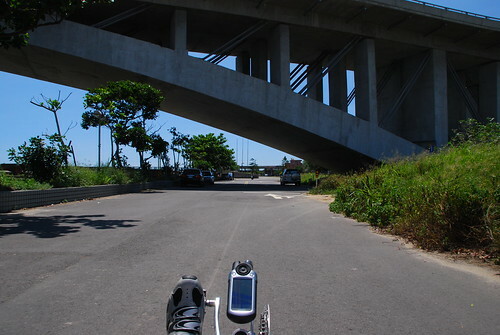 This time, I parked the trike and got onto the walking bridge that goes across the canal. The Taiwan Straight looked absolutely gorgeous today! 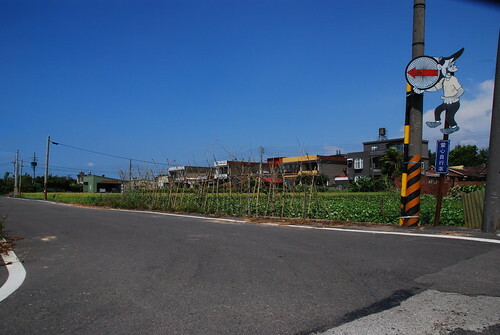 Looking East towards the highway. 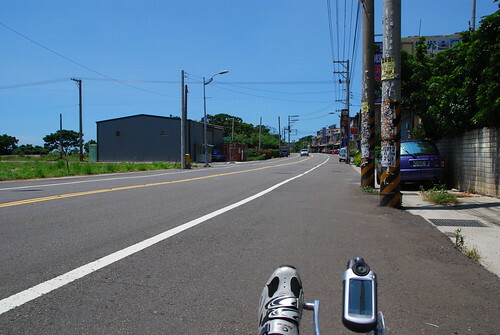 A wide-angled shot looking toward the ‘Straight. There wasn’t enough shade for me to park the trike under. But I wasn’t planning on being there very long anyway. 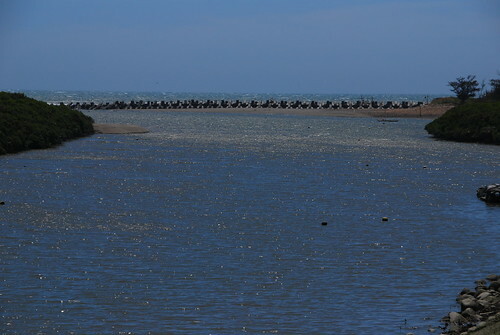 I continued down to the water. 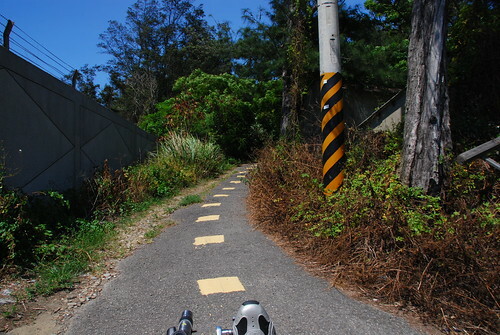 This is the beginning of the bike trail. 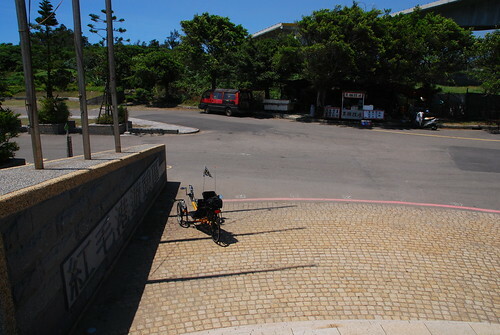 I went out to the edge of the Taiwan Straight and parked the trike again. 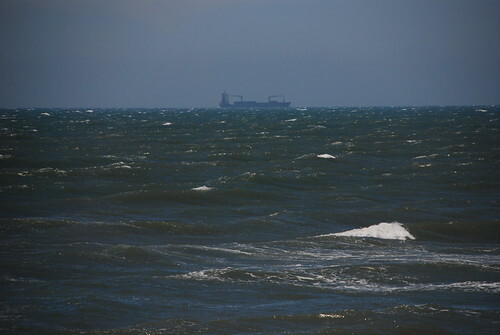 This ship was crusing the ‘Straight. This colored brick work goes on and on…. Today I checked out a couple of shelters to see if they were suitable for having a beach party. More on that later! 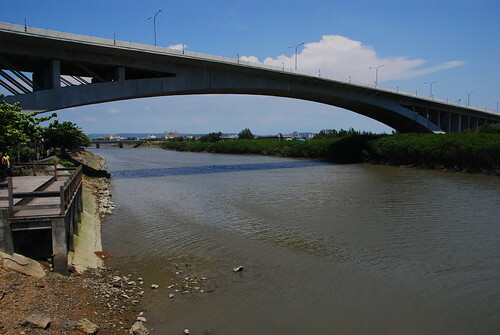 A view of Hsinchu city. 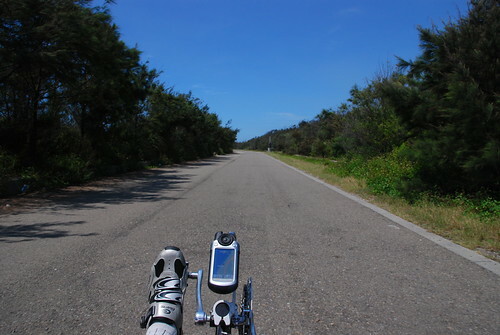 This is not the bike path, but the road along the coast. 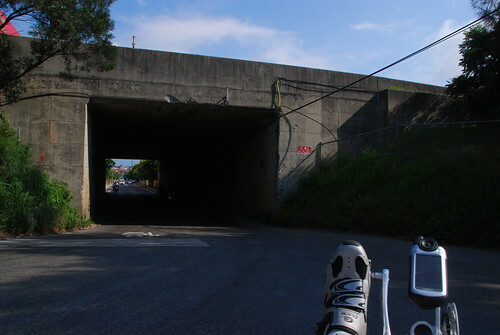 Soon, I took a turn and got back on the bike path. 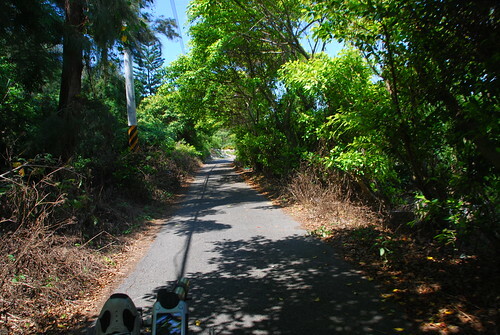 This is a beautifully forested area near the coastline. In a moment you’ll see that I’m heading for the dead-end. 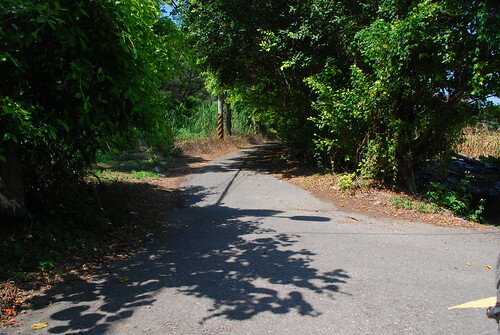 I can get on the trail from there and continue around the dead-end. At times the old trail gets pretty rough! A guy on a scooter came from the opposite way and I had to pull over to let him pass. You can see where we are on the GPS. I moved the equipment around a little bit so one of these days I’m going to have to do another update on the trike cockpit layout. This is the end of the old trail. 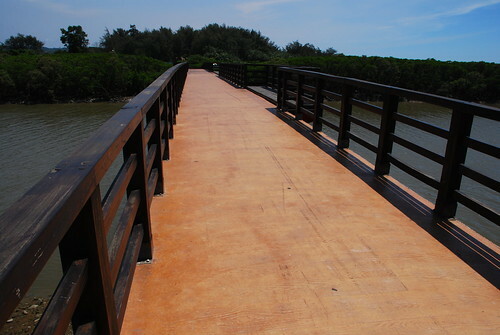 Ahead is unexplored trail. 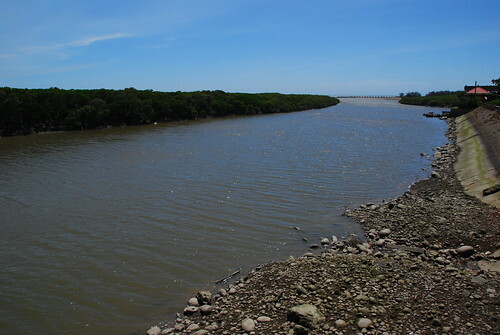 Same position, view to the right. That’s highway 61 at the light. 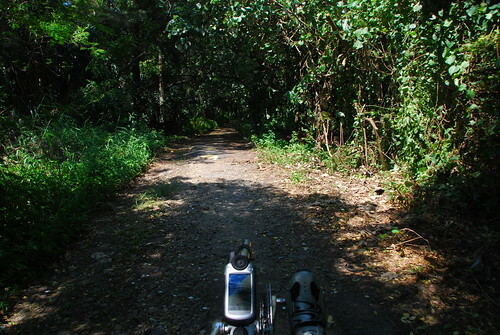 I decided to continue down the unexplored trail to see where it went. I found out: someone’s house! I did a quick turn around because I remembered passing that house before on the highway, and I heard quite a few dogs barking. I didn’t need them chasing me. I took that trail to the right and crossed highway 61. 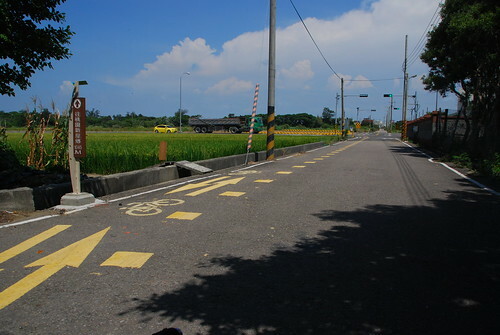 This is a typical bike trail in Taiwan. 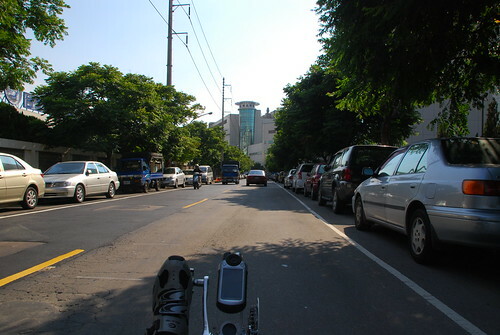 Bikes are supposed to travel in that tiny lane, even if it’s on the wrong side of the road with reference to the direction of travel. I turned left onto a section where I had a run-in with someone’s dog a few weeks ago. That mutt was nowhere to be seen today, though. 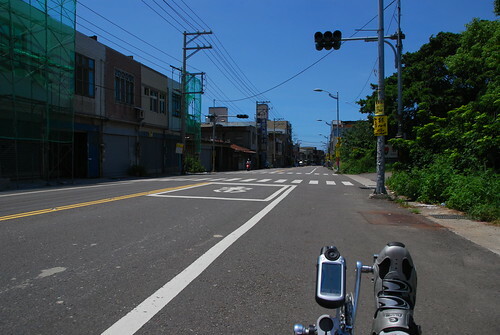 These kinds of scenes are quite common in Taiwan. Bike trail sign points me to the left. out onto a road that crosses highway 15. 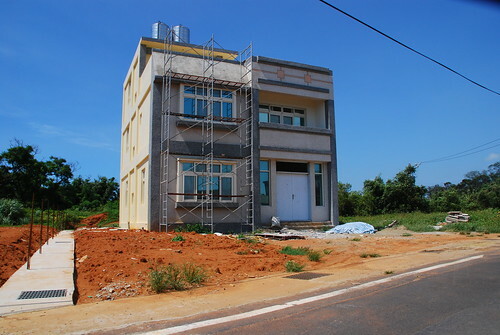 Someone is building a pretty nice house on that road. 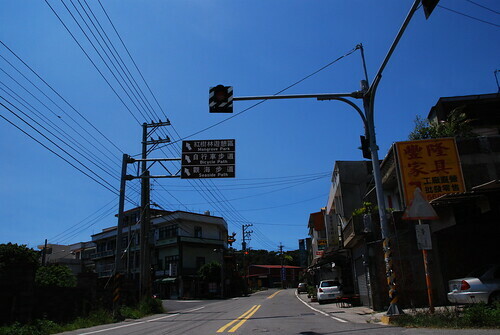 This is route 117 heading in to Hukou. 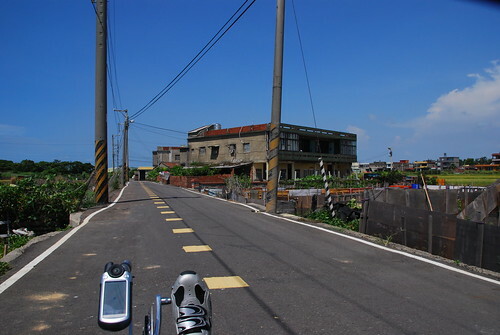 Home is about 10 KM from here if memory serves. 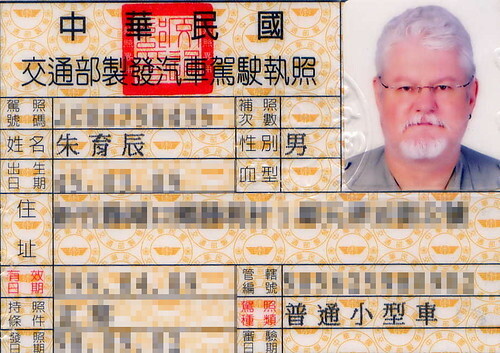 Winding my way down to the turn into Hukou. 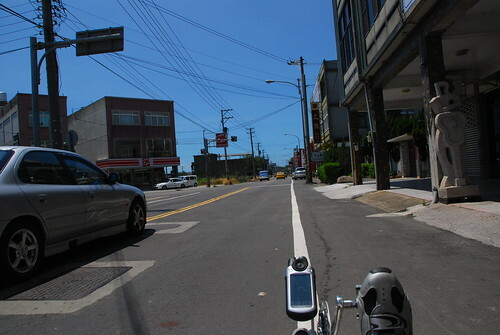 I wanted to head into Hukou to get something to eat. 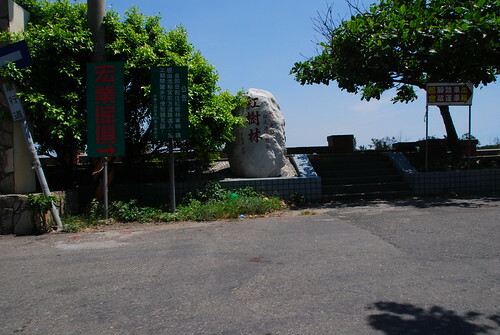 This is a milestone turn-off that leads to the downtown of Hukou. Today I was going to take a slightly different route though. 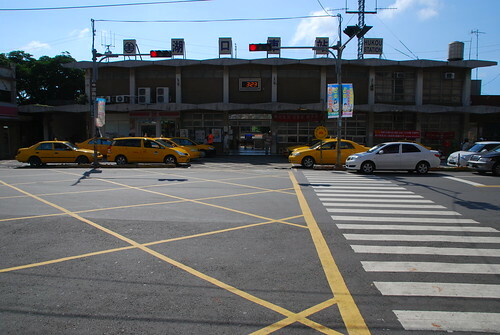 I came to this railroad crossing as I made my way across the tracks an into the main area of downtown Hukou. But the train had other ideas! 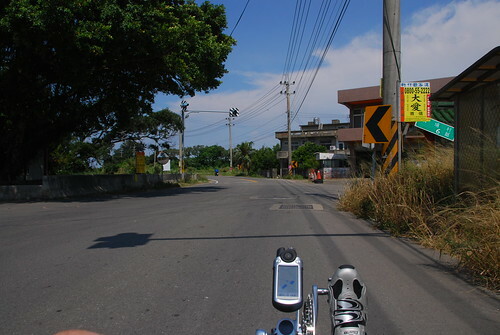 My first stop at a railroad crossing on the trike. When you’re sitting there on the trike and all exposed, you can really feel the power of the train as it passes! 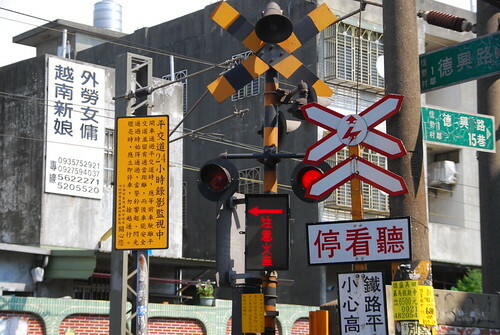 One cool thing about Taiwan’s railway crossings is that they tell you the train direction. That’s not the direction that the train is coming from but rather the train’s actual direction of travel. I snapped this photo as I passed the tracks. Finally, I pulled in at a restaurant across from the train station. This is a very hastily framed shot of my lunch, 1/2 eaten. 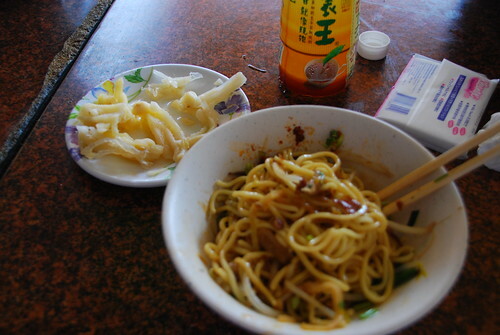 Those are boneless duck feet on the left, and dry noodles. 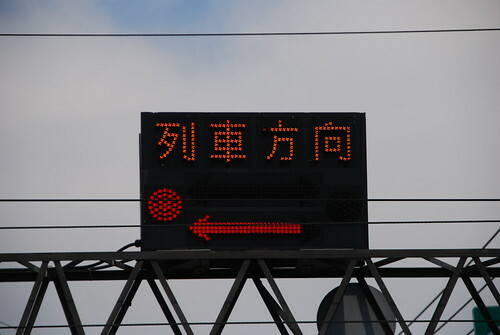 This is the Hukou train station. Hukou has some very beautiful women and they pass through this station a lot. Now I’m on the way home. There is a huge government construction project going on, and the fences go on forever. No one seems to know what it’s all about though. Heading back on the final 5 KM. 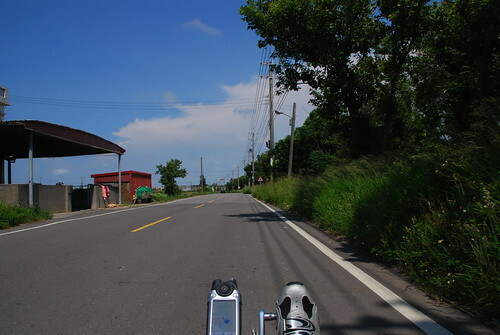 There is a gentle down slope that’s welcome after a long ride. One last hill to climb to get back home. Rounding the summit and on the straight and flat. 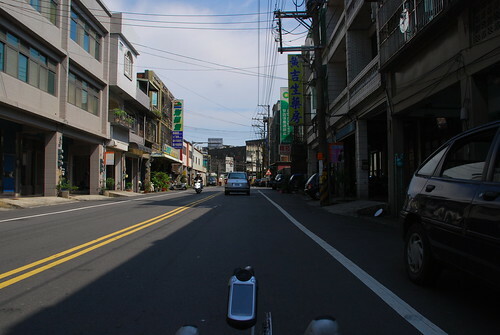 and we’re back in the Hukou industrial area. Thanks for reading. 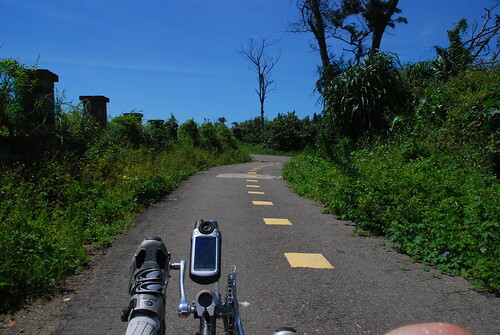 We hope you liked taking this ride with us, and check out the geotagged photos on the map. Please leave us your comments and a rating below! Cool shots MJ! I haven’t been doing any rides outside of my commute on account of the heat lately. 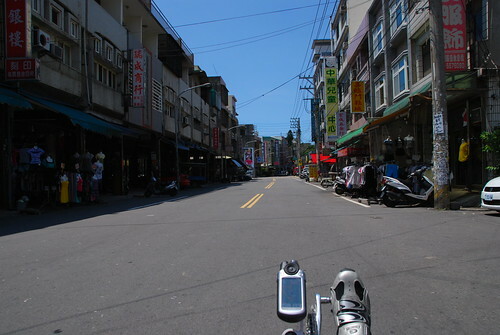 .-= Todd´s last blog ..Kaohsiung – Zuoying Lotus Pond =-. Todd, i don’t blame you! it’s been killer hot lately. 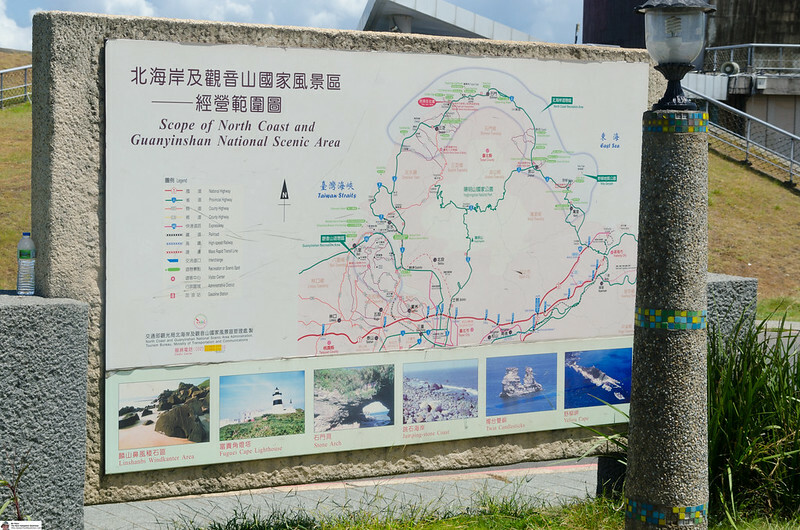 i can imagine all the more so down in Nantou. i’ll probably be riding more on the trainer and indoors in the evening because of this heat. 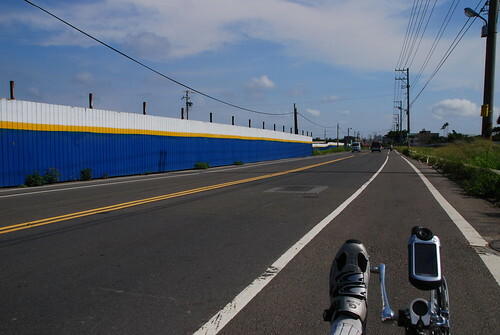 i’m looking at materials to make a shade for the trike. of course i’ll blog on that when it happens. take care, Todd! 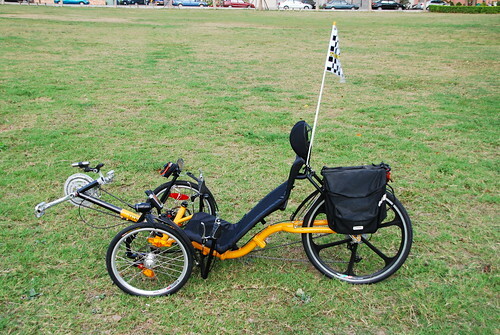 Nice site, great shots and great looking trike. I have one of the original TWBents, black, mono aluminum frame, 26/20 combo. Had it for 3 years and love riding it around here in NH. Liked the meal. We used to have a woman who ran a local Asian resturant and during the Chinese new year she would serve traditional dishes, one of which was boneless chicken feet. They were rather chewy but no bad. Another dish she served was pig’s intestines. Spicy but good. 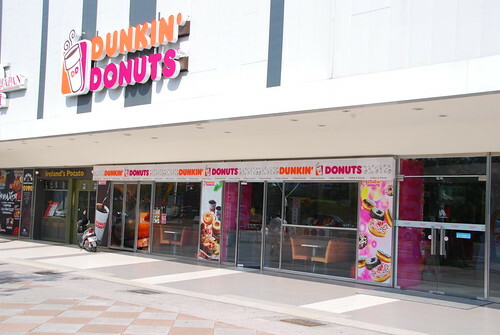 She closed and returned to Taiwan. Really miss her and the food. Oh well the only constant in life is change. I will try to visit as often as I can. 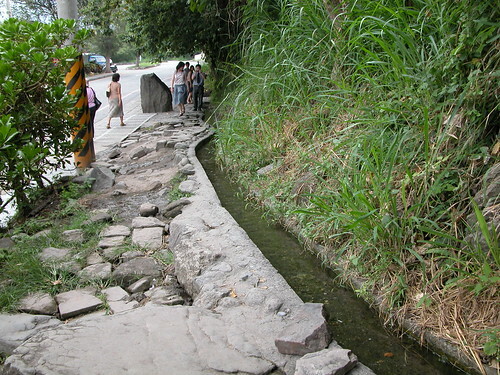 Oh and as to how steep a hill is? The way I see it, it is all relevant to the engine. hi Dom, and welcome to our blog. always glad to have a fellow triker visit us! i think i’ve seen one of those TW-Bents trikes you mention, at the warehouse. things have changed quite a bit since the beginning. where in NH did you live? i lived in Derry, off 93. but i didn’t own a trike back then. Derry had some Taiwanese people too and it was a lot of fun around Chinese New Year. it’s too bad that woman left your area. we like the pig intestines too! the hill really isn’t all that steep. i used to think it was but now that i’ve ridden it several times i just go up without thinking about it. 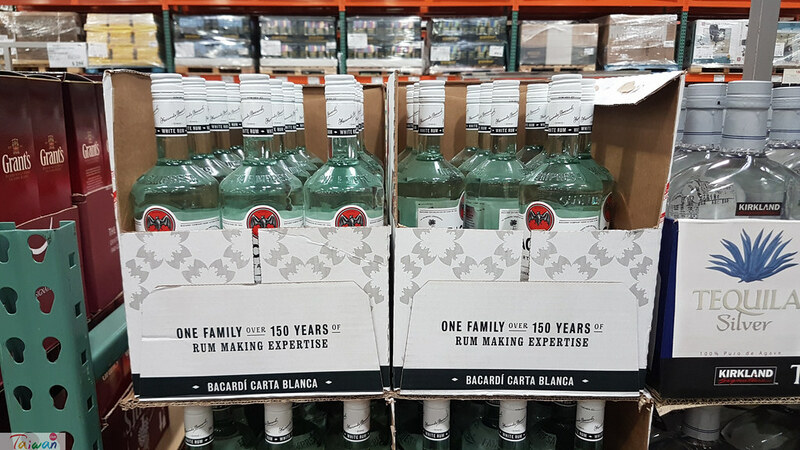 you’re right – it’s all relevant. thanks for your comments Dom. 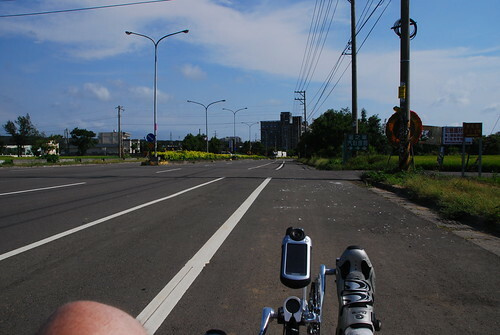 WOW… that seemed like an awfully long ride. 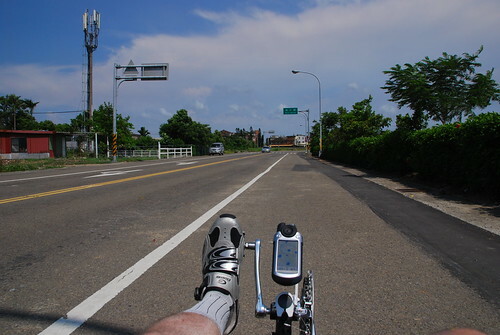 When I have nice weather and go out on rides… I usually only average 15 to 20 miles (24 to 36km). The weather there sure looked nice after how the clouds looked for your roof party. it was mostly cloudy here with a few breaks of sun and a couple of passing showers. The reason why we’ve been having such miserable weather around here is… at this time of year the jetstream should be to the north of us. This would then bring up warmer weather from the south and all of the storms would pass to the north of us. At the time… the jetsream is still to the south of us which allows the storms to travel just to the south of New England and then affect us as coastal storms. .-= mike01905´s last blog ..2009 Phantom Gourmet BBQ Beach Party =-. 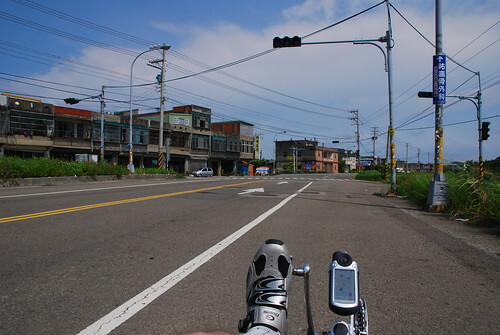 Mike, that ride was 28KM and change. it sure was nice but the sun beat down on me man. i was soaked in sweat – more than i usually am. 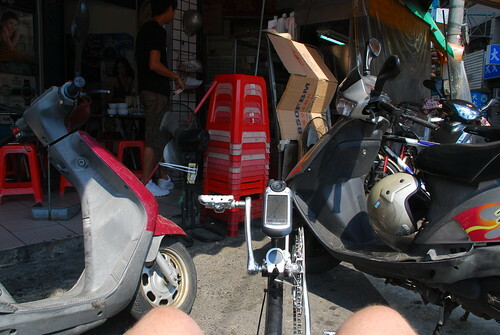 if i didn’t have the webbed seat it would really have been super hot. that’s a good explanation about the jet stream and your local weather. Yeah… I heard someone on one of the local TV stations talk about the jetstram still being to the south of New England instead of to the north like it usually is at this time of the year. I guess its a very good explination as to why we’ve only had one 80 degree (26c) day…. and only four or five 70 degree (21c) or higher days… here in Boston. Here it is almost July… and I haven’t had to use my air conditionor once. Mike, that cooler weather sounds great about now. 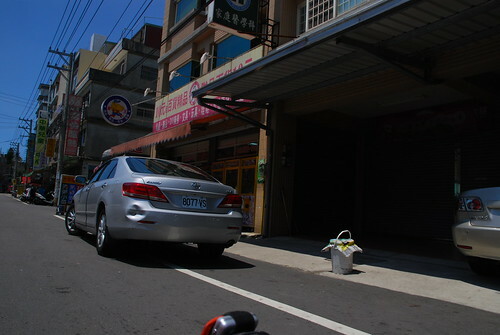 it’s been very hot here in Taiwan! 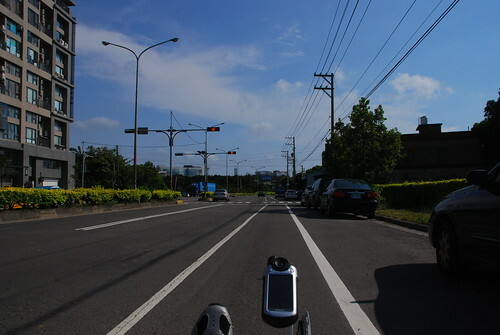 Oh… and from all of the pics… that iide seemed longer than 28km. Mike, yes i wanted a higher number of pics than i have posted per ride thus far. when my GoPro cam comes later this week, that will make photography and video from the trike a whole lot easier! Awesome photos MJ. 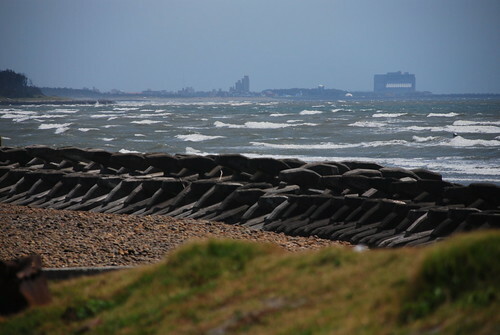 Love the photos near sea especially. Man I would love to join on one of these rides soon. 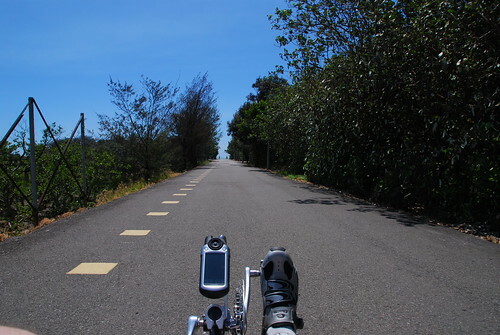 Though from what I see here you ride pretty long distances, which I just may not be able to in the beginning. 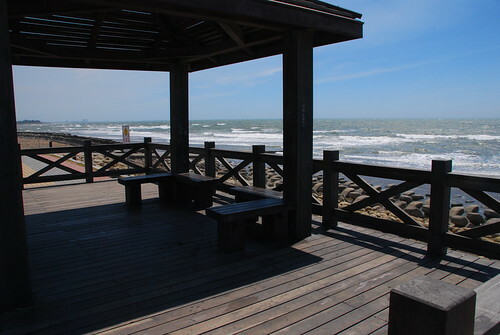 .-= Ashish´s last blog ..BBQ afternoon in Sanxia =-. 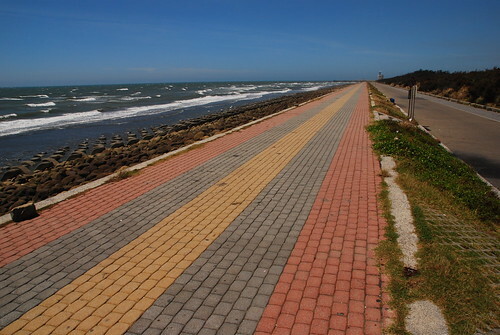 Ashish, the distance to the coastal area where i ride is just about 7 KM, so it’s very doable. 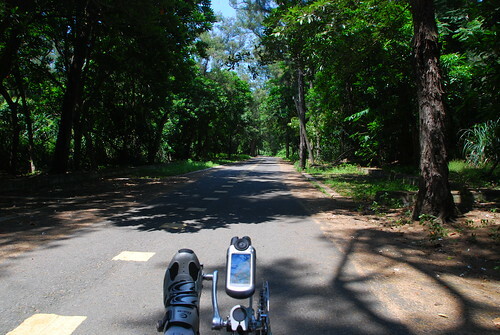 you should join me for a quick 20KM ride some afternoon. 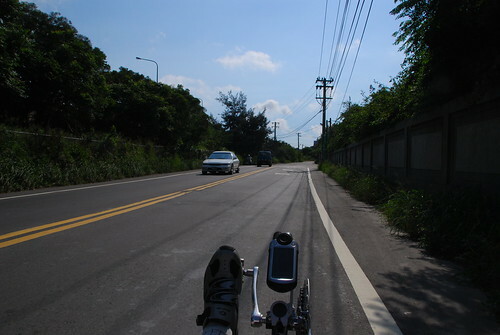 i’m sure you can handle that seeing how you’ve ridden to our home from Jhubei before! thanks and take care. As always, I enjoy reading your bike ride descriptions. Keep ’em coming! 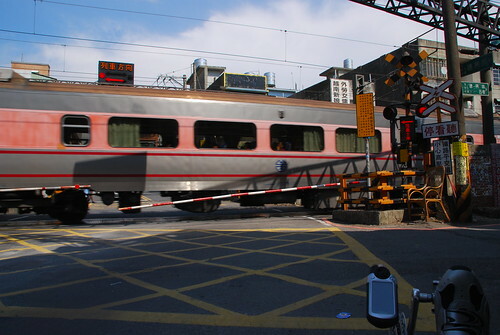 BTW, train crossings in Japan also tell you the train direction. 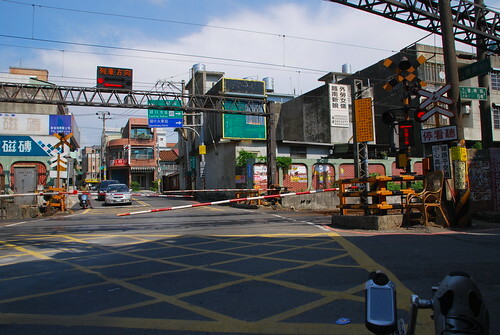 One thing I’ve observed is that the crossing gates in Taiwan come down earlier and go up later than the ones in Japan (in other words, you wait longer for a train to pass here). 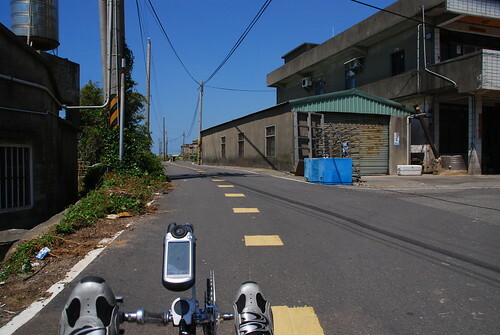 .-= Kaminoge´s last blog ..The horror that is Taiwan Beer =-. Kamingoe, i just got a new video camera designed for recording sports action. 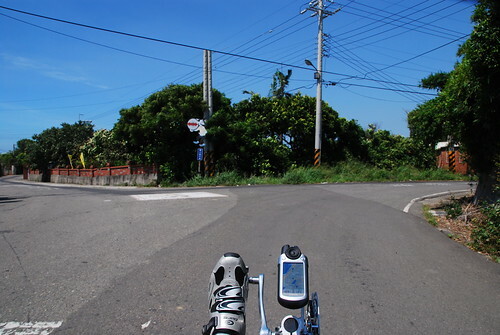 i’m looking forward to doing more ride reports with video and interval photos. 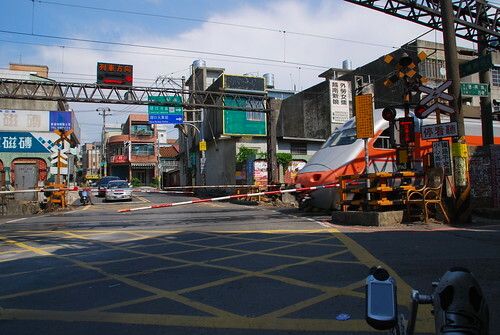 oh that’s interesting about the railway crossings in Japan. 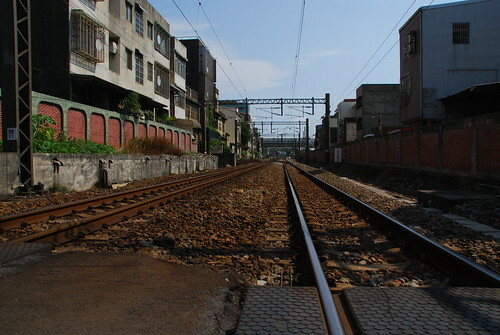 as we know, Taiwan got it’s first railroad from Japan. i would think the systems were somewhat similar even today. thanks for your comments!